The company’s civil engineering operation carries out works for both public and private sector clients in Northern Ireland and the Republic of Ireland. Over the last 60 years the contracts division has gained valuable expertise in carrying out a wide range of projects, as detailed below. 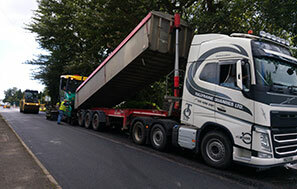 If you have a question with regards to any of the surfacing products or road laying services that we provide, please do not hesitate to get in touch. Our friendly and helpful staff are always on hand and happy to help with any queries you may have.